1. Fill 8 balloon or wine glasses with ice. 2. 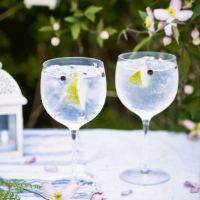 Divide the gin, juniper berries and lime equally between the glasses. Top up with elderflower tonic and serve. This recipe was first published in Thu May 21 13:03:00 BST 2015.